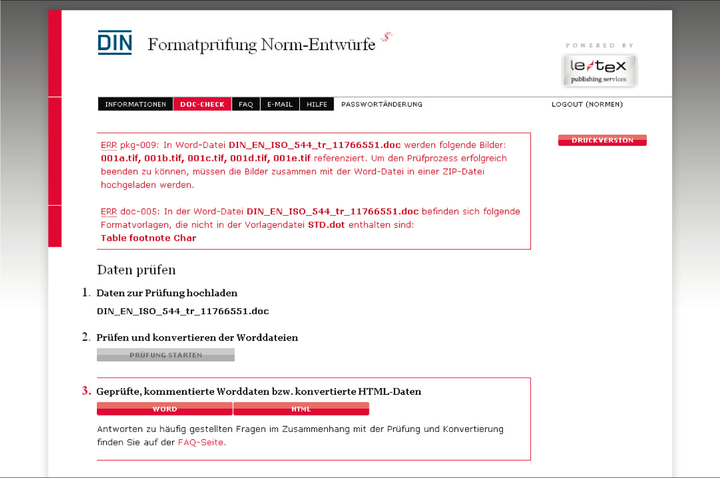 Every year, DIN Deutsches Institut für Normung e. V. publishes approximately 2,000 draft standards. These drafts, which are usually Word files with TIFF images, are all to be converted to XML for display on the DIN draft standards portal. However, to convert reliably from Word to a pre-defined XML format, some degrees of freedom must be suppressed in the Office application. For this purpose, the DIN authors can use le-tex aspect with the “Upload-Check-Convert” principle. An extensive, configurable system of rules currently consisting of around 45 checking rules monitors compliance with a wide range of conventions in the background – from image resolution to correct text markup. If the checked manuscript conforms to the requirements, the data is automatically converted to XML as far as possible or prepared for further output data. le-tex aspect therefore acts in a sense as a creation guideline set out in program code and helps DIN to output its various input data in a standardized way – quickly and easily. Dr. Hartmut Strauss, Divisional Director Information Technology, DIN Deutsches Institut für Normung e. V.